Infinix Smart 2 VS Infinix Smart 2 Pro: Budget smartphones from Infinix. Infinix has shifted their attention to the budget-friendly Smart-series. 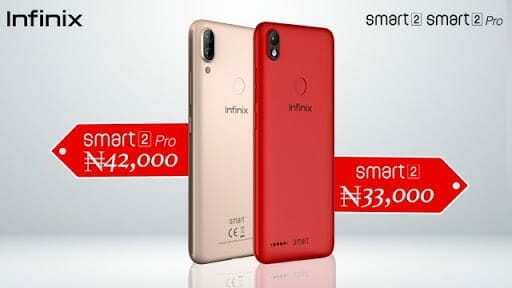 The OEM company has released the Infinix Smart 2 and Smart 2 Pro. The second generation smartphones comes after almost a year since the first Smart smartphone. But the two phones were released quietly unlike the hype that came with the Infinix Hot 6, Hot 6 Pro, Hot S3 and Note 5. There was no bigger variant for last year’s Infinix Smart, which makes us excited for the new Smart 2. In this article, we’ll be comparing the Infinix Smart 2 with its bigger variant, Infinix Smart 2 Pro. Both smartphones are budget-friendly, so how bigger of a smartphone is the Smart 2 Pro? We’re just about to find out. The design of the Infinix Smart and Smart 2 Pro are somewhat similar. They both got a front glass with plastic unibody. The plastic back has a metallic finish. The back of the Infinix Smart 2 Pro features a dual rear camera, a LED flash and a fingerprint sensor. The dual rear camera is placed at the top left corner in a vertical direction. While the Infinix Smart 2 comes in two versions. The smaller version has no rear-mounted fingerprint sensor. It only features a single rear camera and LED flash. While the bigger version features a rear-mounted fingerprint sensor. Both the Infinix Smart 2 and Smart 2 Pro features face unlocking system. This is really a great deal here considering their actual budget smartphones. Both Smart smartphones weigh 148 grams and measures 8.4 mm in thickness. Also, they’re both available in the same body colors; Red, Rose Gold, Blue and Black. The display is very much the same on both Smart smartphones. They sport a 5.5-inch HD+ IPS LCD touchscreen with 79% screen-to-body ratio. The display features an 18:9 aspect ratio, 720 x 1440 pixels resolution and 282 pixels per inch density. The 18:9 aspect ratio display makes both phones ideal for watching movies, music videos or playing games. The Infinix Smart 2 features a single rear camera consisting of a 13MP sensor. Flipping over to the front, the Smart 2 is blessed with an 8MP selfie shooter. While the Infinix Smart 2 Pro packs a dual rear consisting of a 13MP Primary sensor and a 2MP secondary sensor. The front camera of the Smart 2 Pro features an 8MP selfie shooter. The camera of both Smart smartphones features a bokeh effect. While the Smart 2 Pro adds portrait mode feature. The hardware is the same here, which is surprising to me. They’re both powered by MediaTek MT6739, chipset, PowerVR GE8100 graphics processing unit and Quad-core processor, which clocks at a maximum speed of 1.5GHz. The Infinix Smart 2 and Smart 2 Pro runs on Android 8.1 Oreo with XOS 3.3 hummingbird overlaid on top. The Smart 2 Pro comes with a 3GB memory and 16GB internal storage. While the Smart 2 comes in two memory versions. It has the 1GB memory version that has no fingerprint sensor. And the 2GB memory, which features a fingerprint sensor. The battery life is the same on the two smartphones. They both pack a non-removable Li-lon 3050 mAh battery with no fast battery charging support. The Infinix Smart will be available for about $119 (€99). While the Infinix Smart 2 Pro will cost around $139 (€119). The specs and features of both phones are very okay with their respective prices. This is probably one of the best budget smartphones Infinix has ever manufactured.